Got a small business in Uptown that could use some cosmetic improvements? There's money available! 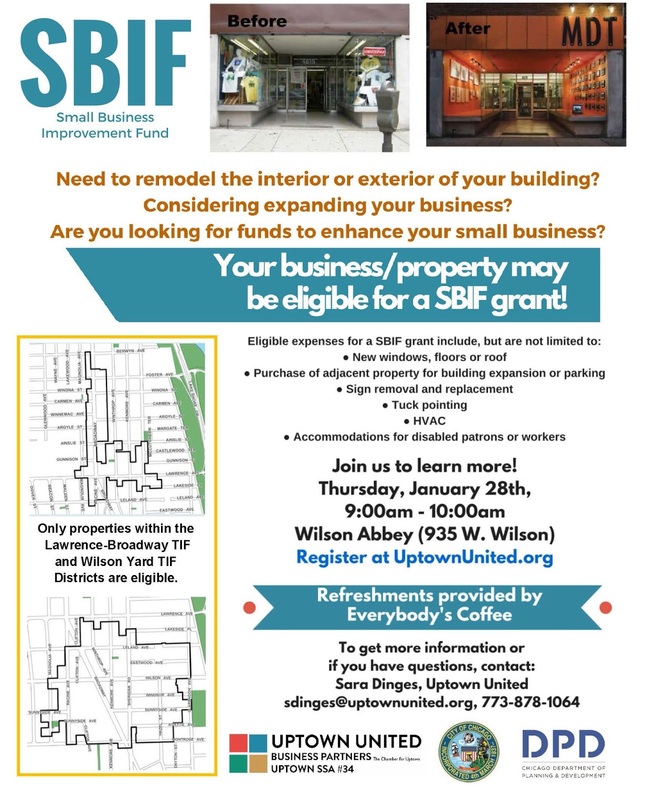 If you own a commercial property or business located in the Wilson Yard TIF or Lawrence/Broadway TIF districts, come find out more information about the Small Business Improvement Fund grant application process. Uptown United and Business Partners - The Chamber for Uptown are hosting an Uptown SBIF Informational Meeting on Thursday, January 28th from 9am to 10am at one of Uptown's creative hubs, Wilson Abbey at 935 W. Wilson. This informational session will cover a spectrum of options for business and property owners located in the Wilson Yard TIF or Lawrence/Broadway TIF districts. More information and free registration is here. Readers, even if you don't own a business, please contact your favorite business owners and make sure they know about this meeting. There are so many businesses that could use a makeover/spiffing up, and the owners many not be aware that there's money available to them. Please make sure they are aware. This is so great I hope all business owners know about this.This can only improve our community and win win. The Ace hardware store definitely can benefit from this. Plus the stores and restaurants across from Sonic on Wilson Ave. And last the eye glasses store on Wilson Ave next to that clothing store. The clothing store has done well upgrading their windows but they need to cleanup the windows where they have their jewelry displayed. Those couple windows are a sore eye because their right in the corner and they are never cleaned. Oh and I forgot the whole mini mall on the 4500 block of Sheridan can use a facelift! That way La Ciudad and the rest of the stores and restaurants become more appealing for walking traffic. La Ciudad is the nicest looking space in that mini mall. Now just cleanup the rest and outside exterior of the mini mall.